The Stairway Special gate can be used even when your staircase is not square; rather, it can be used for areas with up to 30 degree angles for round and oval areas. It has an easy lock that can be opened with one hand by adults, but at the same time, the lock is complicated for a child to operate. However, just because the gate has been specifically designed for staircases doesn’t mean that it cannot be used somewhere else. If you happen to move to a more compact house that does not feature stairs, you can use the same safety gate for doorways, hallways and other entrances in your new home! The Stairway Special Gate from Cardinal Gates is 29.5 inches in height, enough to assure you that your toddlers and smaller pets cannot get past it. 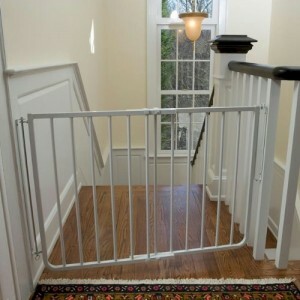 The gate can also easily fit openings from 27 inches to 42.5 inches, making it easier for you to install whether you have a regular-sized staircase or a wide one. 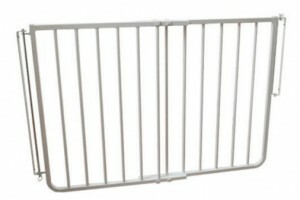 With additional extensions ordered separately, you can lengthen the gate to fit openings as long as 64 inches. Each bar is spaced at 2.5 inches, so there’s no chance of your toddler’s body parts getting stuck in them. The stairway fits beautifully with your stairs – no matter what shape or how wide it is – and assures you safety of your family. 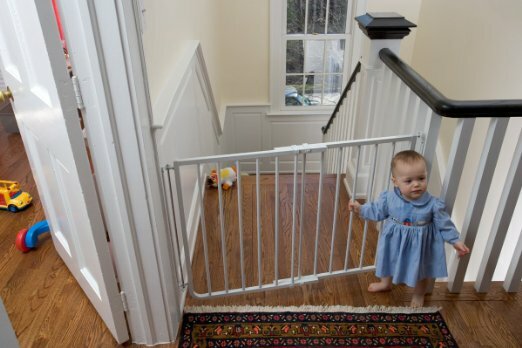 The gate is not only operable by one hand for your ease of movement, but the lock is complex enough to baffle your growing toddler. You can depend on them not to understand the mechanism of the lock until they are old enough to be trusted alone on the stairs. Moreover, the gate contains a stop bracket that stops the gate from opening too widely at the top of the staircase. This stop bracket is optional but recommended as it can prove to be very useful in moments of need. Since the Stairway Special Gate from Cardinal Gates is especially made for staircases, for external uses, you need to purchase a separate hardware pack which is made from stainless steel. Besides, the latch was made complicated intentionally so that toddlers and young children cannot figure it out. The same logic can sometimes apply to adults who might have trouble understanding the mechanism of the latch until it is explained to them.